Nolusindiso is HIV positive and a mother of a 12 year old. Before joining Circles of Support she was a loner. She struggled with the idea of her HIV status and found it incredibly difficult to communicate her past to those around her. She didn’t know her mother and lived with her great grandmother until she passed away, then her grandmother until she passed away and was left to her aunts and uncles who would insult her about her status and eventually chased her away. They told her, “this is not your home”. Her mother owned property and she never understood why she wouldn’t let her stay there. Nolusindiso was out on the street with no support when a kind neighbour stepped in and bought her a shack. She is still depending on her neighbours but is fortunate enough for her child to be staying with his father who can provide for him, so she now only has to worry about herself. “I used to see the people in Yabonga uniforms and I approached them and one of the councillors referred me to Circles of Support”. The group has taught her how to converse and connect with others, she can communicate more effectively and knows that the actions of a person do not define who they are as a whole. 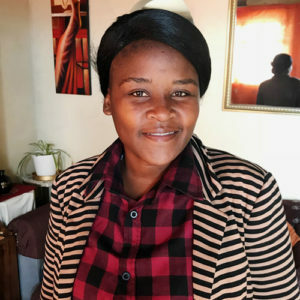 “I have learnt to not use attacking words like ‘you behave like this’ but rather to tell someone how it makes me feel.” She no longer feels emotional when telling her story and is calm and comfortable with her status and her knowledge of HIV. Nolusindiso is a success story as she is involved in training groups at Yabonga, which she is thoroughly enjoying and is a dream come true for her. Through the training, she now holds the potential for employment. NACOSA has partnered with Synergos since July 2014 on integrating social connectedness in its orphans and vulnerable children (OVC) programmes. One of the programmes run by NACOSA, through its partner Yabonga, are Circles of Support where care workers are capacitated to run support groups for caregivers of OVC.